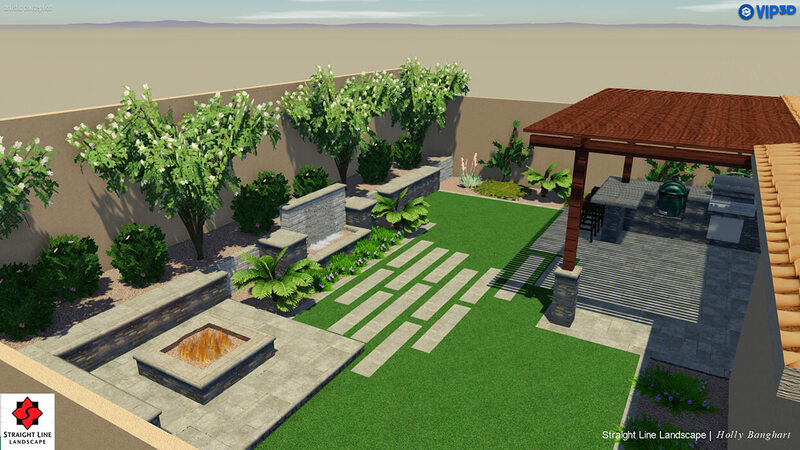 Your experience at Straight Line Landscape begins with our custom landscape design process. 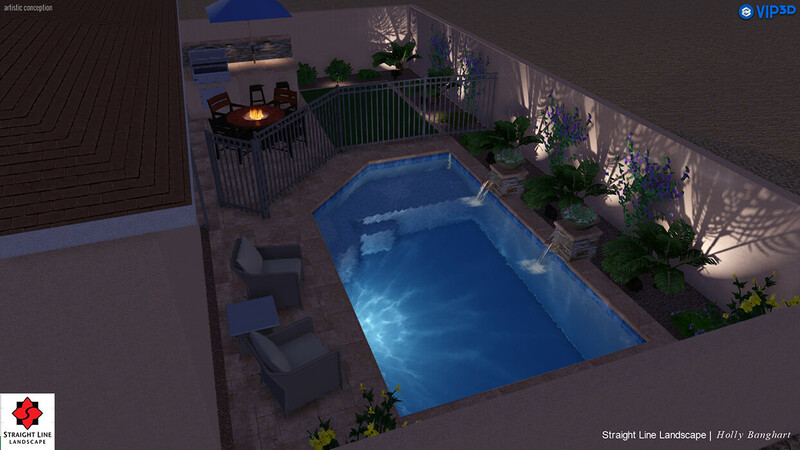 We’ll work with you to create a clear design focused on how you intend to use your outdoor space. Below you’ll see exactly how your project will unfold, from your first vision of kids doing cannonballs to actually feeling the water on your skin. Our design process starts with a 5-10 minute phone call with our expert design team. 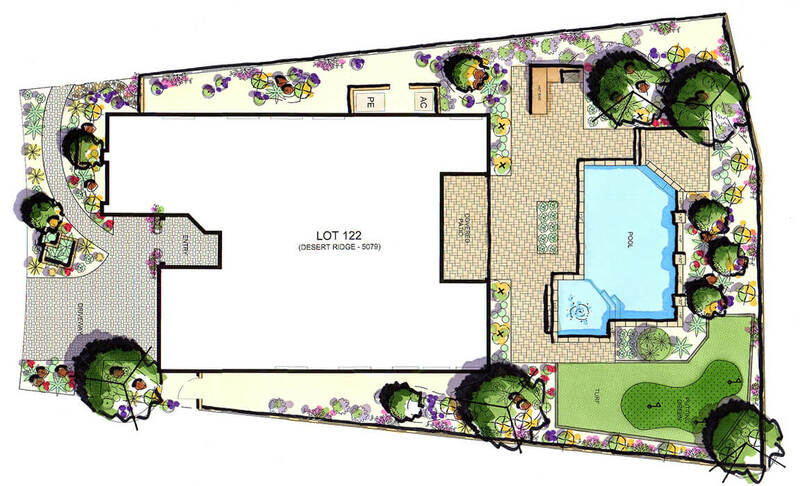 Here we’ll get acquainted and begin to understand how you want to use your outdoor space. We’ll ask a few questions about your project, including the area of your space, front yard vs. backyard, any features you have in mind, when your house will close, and what you’re looking for in a contractor. After listening and getting a sense for your project, we’ll schedule a meeting in person at your home. As we look ahead to our meeting in person, you’ll have a chance to get creative. You’ll go through some of our project services and galleries, and begin to ask yourself some basic questions about what you really want and need. 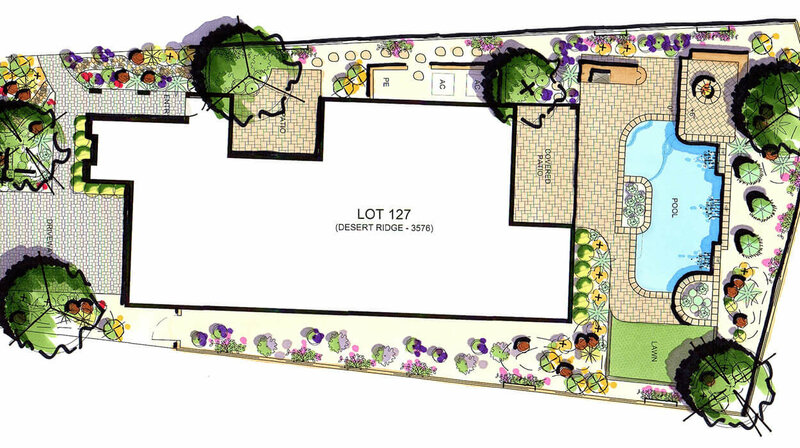 This process is geared to help you build your landscape vision. After you have an idea of what you want you’ll fill out our Online Project Inquiry. This is an easy online form where you’ll give us a better idea of how you want to use your space, what features you’d like to include in your design. You can even give us examples of what you are thinking. Here’s where our designer brings your vision to life. When we come to meet you in your home, our design expert will come prepared with ideas, things to consider and visual examples of work we’ve done for your neighbors. You’ll show us your home and give us a general feel for your space and your surrounding area. Our expert design planner will be looking at your space with an eye for location of utilities, privacy considerations, elevation changes, sun exposure, and other project considerations that will be addressed in our design. You can count on us to listen and understand what you’re looking for. This should take about 60 minutes, and everyone making decisions on your project should be there. Next we’ll put our creative expertise to work, providing you with a complete, custom, proprietary design. We put a great deal of time, energy and care into your design, so it takes 7-14 days for turnaround. 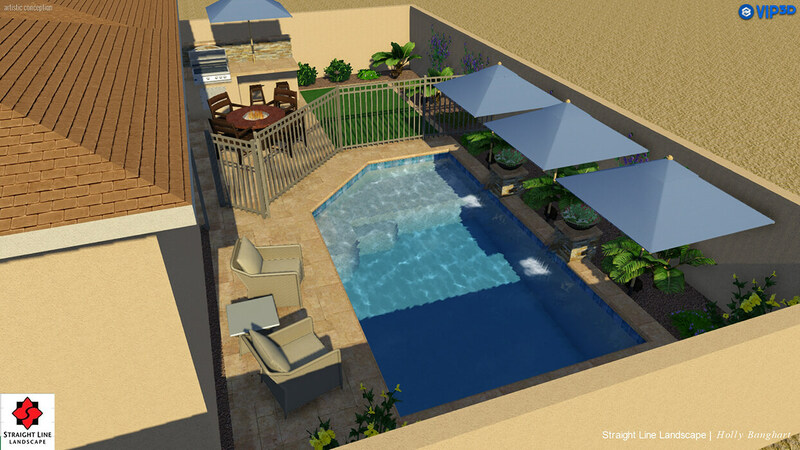 Depending on the extent of your project, we’ll either create your design as a CAD drawing or a 3D rendering. In any case your design will be 100% customized to your space and vision. When your design is ready we’ll contact you to schedule our design presentation. Here is where your landscape project details unfold. You’ll see how we have integrated your wants and needs, and addressed your concerns. We’ll make sure we’ve covered everything on your wish list. You’ll be able to choose between your options for materials, and we’ll examine any HOA guidelines with solutions for how we’ll meet them. Finally, we’ll review your budget again and make sure we’re on the right track. You’ll walk out of there with pricing and a snapshot in your mind of what your landscape is going to look and feel like. Let’s plan for 60 minutes, and everyone making decisions on your project should be there. From here we’ll make revisions to your design based on our discussion and feedback. After our design presentation meeting we’ll knock out our list of design revisions, then set up one more meeting to review. We’ll make sure we’ve done everything we talked about and the design is what you had in mind. If there are any final adjustments we’ll make them here. During this meeting you’ll select your final colors and materials. We’ll plan for 30 minutes at our office, and everyone making decisions on your project should be there. You’ll also get a final price breakdown, complete your contract and put down the deposit. Next we’ll create your construction drawings. You’ll be presented with a ⅛ scale drawing with name and quantity of all materials, botanical and common names for all plants. We’ll specify which materials are going on which surfaces, the finishes, and every single detail of your project will be spelled out. 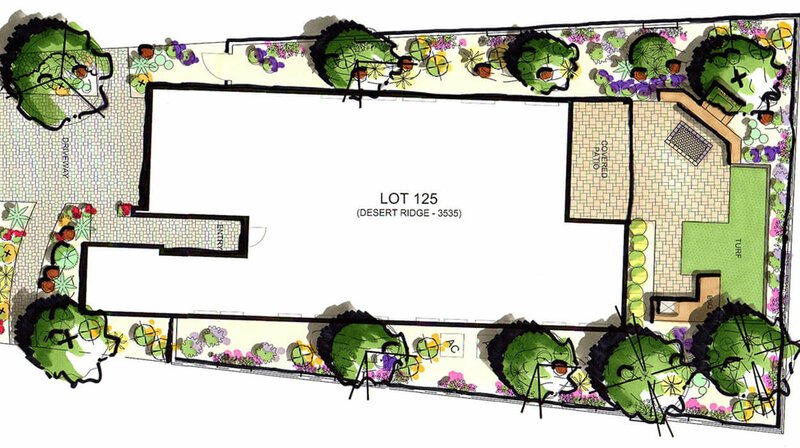 In this step we’ll also prepare drawings for your HOA and work through their approval process. Every HOA requires different information in their plans for submission, and each has a different approval process, sometimes requiring more details and information than our actual construction plans. From here we will schedule your project, usually 4-6 weeks out from contract to project start date. Due to the complexity of scheduling crews, materials, and plan changes, we provide an estimated “week of” for your project start date. This will allow us to dedicate our full attention and focus on your project when it’s your turn. When we start construction at your home, we will be 100% dedicated to your project and we won’t rest until it’s finished. You won’t need to provide direction or oversight, or even be present, although you’re welcome to. Our skilled crews will arrive on-site knowing exactly what they need to do. You’ll simply be able to watch the execution of your design vision as it unfolds. Our crews have a plan and goals for each and every workday, which are planned based on goals rather than hours, so we won’t leave until those benchmarks are hit. Once they finish their work for the day, they won’t leave until the site is cleaned up. When construction is completed we’ll do a final walk-through. Here we’ll answer any questions you have while keeping a punch list for any outstanding items that need to be addressed. We’ll also review our warranty policy and procedures, show you how to use any equipment, and accept your final payment. With your project is completed you’ll be covered under our warranty policy. We ask that you make any service requests through our warranty page, which we’ll typically have scheduled within 48 hours. We’ll always be responsive, and we’ll always do our best to make sure you are 100% satisfied. With your landscape project complete, the last step is to enjoy. Have the neighbors over for drinks and enjoy the food cooked in your outdoor kitchen. Invite the whole family over, and watch the kids laugh and play, or just enjoy the peace and quiet, with the sound of a fountain trickling in the warm Phoenix evening. When you come home from work, it feels great to pull up to a beautifully landscaped yard. You’ll be glad you chose Straight Line, the right contractor for the job.